People have been building dry stone walls for centuries. Take a visit to Ireland and you’ll see walls that appear to defy gravity winding amongst the green hillsides. 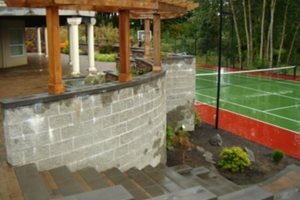 Similar walls can also be seen in older parts of the U.S. Today, you can create a similar look in your own landscape with dry walling techniques. 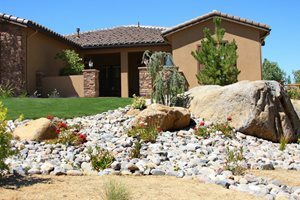 You can opt for a wall made of many small stones or a wall made of large boulders. These walls appear to be dry stacked, but really have a block support structure. 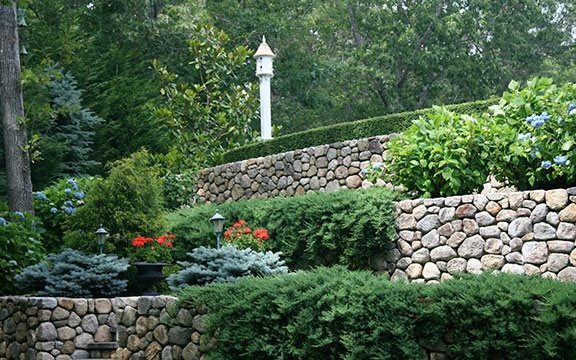 Elaine M. Johnson Landscape Design in Centerville, MA. In New England, dry stone walls of colonial times are still existent in the countryside while their mortared counterparts disintegrated long ago. This age old form of construction, brought with the colonists from England is more than just a building trade, it is an art known as "dry walling". What makes it so difficult is the way stones are laid ensures the core remains dry in all weather. Water accumulating in the interior of any dry stone wall will destroy its integrity, particularly in cold climates with severe freeze-thaw cycles. In the regions where it was first established, dry stone work remains a viable part of landscapes where the regional design vernacular has kept dry walling alive. The degree of difficulty drives the cost of such stonework much higher than any other form of masonry. Marco Romani, Landscape Architect of Glencoe, IL believes the best way to obtain this look without the demand for a highly skilled drywaller is to use dry stacking. This technique utilizes a traditional concrete block core. "One end of the dry stone is stacked against the core where the mason mortars it in place, while the other half of the stone on the front of the wall is free and clear of any sign of mortar. This not only creates a believable effect, the block can be waterproofed on the back side so that moisture will not penetrate through to the dry stone mortar." 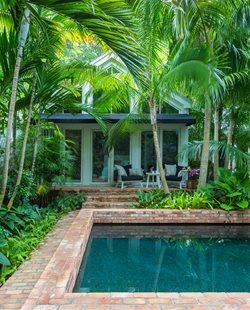 On this property boulders were used to terrace the yard into two levels. Copper Creek Landscaping in Mead, WA. 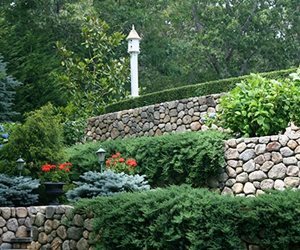 Another method of using natural dry stone as retaining walls results in the use of boulders to hold back ground. This kind of wall depends on the very weight of the boulder itself for stability. 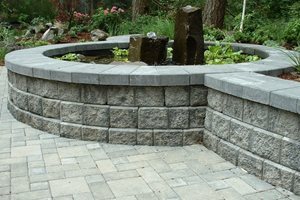 However, this method should not be considered as solid as a more traditional retaining wall. One reason for this kind of wall is to raise planting areas above grade due to high water table or dense, poorly draining clay, hard pan and bedrock. 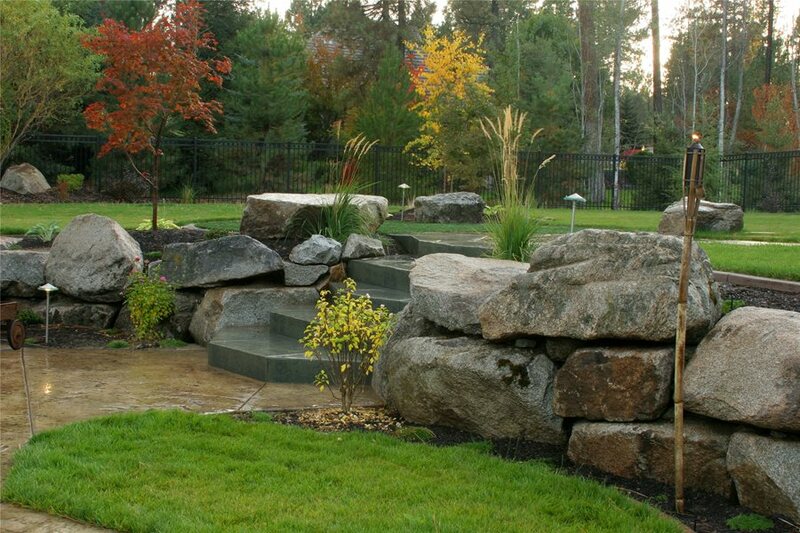 The boulder allows for a natural barrier to hold back imported topsoil. This elevation ensures the root crown and much of the root zone itself is adequately drained for the average landscape plant to survive. 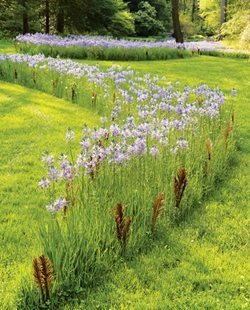 For customers who are keen on using native plants, particularly those that originate in mountainous regions of the west, fast drainage is essential. 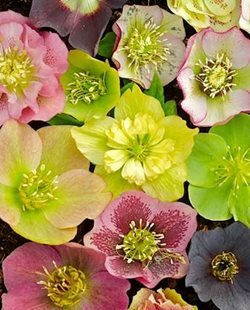 They may even choose this method to elevate planting even though reasonably well drained soils exist on site. Natives thrive in the nooks and crannies created behind and in between the boulders which create a setting that is similar to their habitat of origin. Large boulders must be hand selected and heavy equipment is essential to setting them just so to exploit the natural beauty of each one. 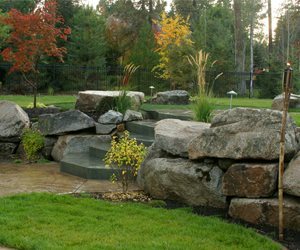 Your contractor may visit the stone yard and hand pick the boulders, particularly where lichen and moss encrustations are desirable for the project. Be aware that if boulders are not locally available, transportation costs can be considerable due to size and weight. The weakness of this solution is that these boulders function much as they would in nature. It can be difficult to control water flow in and around such barriers because there are gaps where the stones meet unless mortared into place. These allow water and sediment to flow through and may deposit beyond the face of the wall during periods of heavy or rapid runoff. But when beautifully planted, there is no more natural solution to a slight grade change in a landscape.